Joan from Joan’s 5 Star Reviews is thrilled to share with you this tasty giveaway! 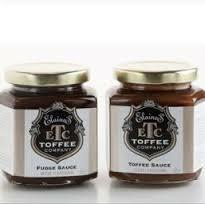 Elaine’s Toffee Company is an award winning producer of English Toffee products, including the awesome sauce pairing being offered. With it being summer, Elaine’s Toffee Company cannot ship chocolate unless the buyer is willing to pay for overnight shipping, which can get expensive. They can however ship their sauces. Summer time is a great time to try the Sauce Pairings. They are perfect over ice cream on a hot day! How about adding some flavor to your iced coffee? Pour some Elaine’s Toffee Sauce over a nice brownie for a special treat. How about a fruit dip? The uses are limitless. Joan says these sauces are the best she has eaten and she now always keeps them on hand in her pantry. She has even been known to just eat a little spoonful on it’s own when craving something tasty. Made with real cream, it is cooked slowly to obtain that rich, creamy buttery flavor. is “everything” an acceptable answer? that’s the true answer. but I’d start with some milk chocolate almond toffee nuggets. mmm, nuggets. I want to try the Chocolate Toffee Almond Toffee Squares. I would like to try the sugar free dark chocolate almond toffee. Looks really delicious! I would want to try the dark chocolate almond toffee. Sounds delish! I’d love to try their Dark Chocolate Almond Toffee. YUM! My mouth is still watering but the toffee bars, all the sauces, anything chocolate. The Dark Chocolate Almond Toffee looks amazing! I’d like to try the sugar free dark chocolate almond toffee. I’d most like to try the milk chocolate almond toffee squares….yum. I would also like to ry the chocolate almond toffee. I want Milk Chocolate ToffeeAlmond Squares. YUM.